Inspiration is a funny thing. You just never know where and when it will strike. A couple of weeks ago, I was digging through my yarn stash and stumbled across a bag of odds and ends left over from various project. In the bag was a ball of kelly green yarn left from a gansey I had knitted for the boy a couple of years ago. I kept the leftovers out because I thought I could use them as hat-knitting fodder. A few days later I happened to glance at a photograph that sits on our mantle. It is a picture of me, the DH, and the boy taken at a Dayton pub on St. Patrick’s Day in 2009 following Cousin Vickie’s lovely Irish wedding. 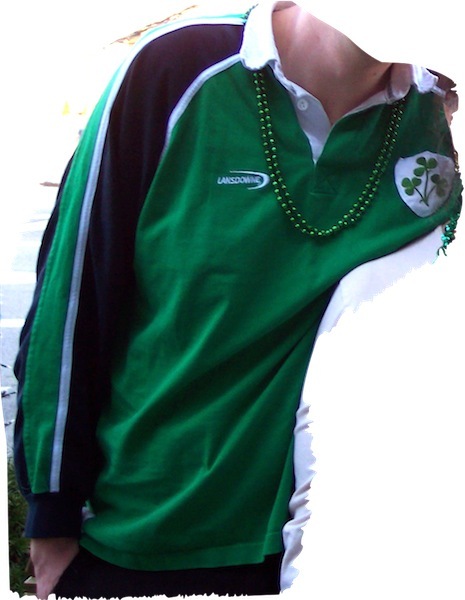 In the picture the boy is wearing an Ireland Rugby jersey we had given him as a Winter Solstice gift. Picture a light bulb above my head switching on and glowing bright. Yes! thought I. That would make a great hat! And I had just the perfect colors. So, I sat down and planned the colors and striping. 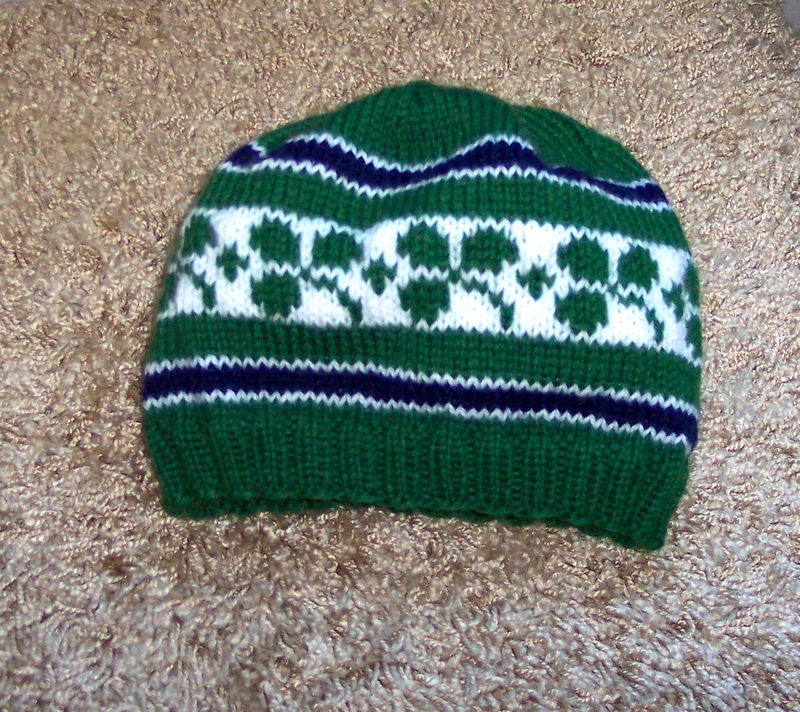 Then I got out the graph paper, found a shamrock chart in Sheila McGregor’s book Traditional Fair Isle Knitting, and adapted the pattern to my hat. Add a little knitting and, voilà! This entry was posted in Hats, Knitting and tagged knitted hat pattern, knitted hats. Bookmark the permalink. Rreally beautiful hat, thank for sharing the pattern. Does “the boy” wear the hat too? Or did he just get the sweater? 🙂 The hat looks GREAT! What a perfect pattern for St. Patrick’s Day! Love your blog! Hi Gayle, I’ve just found your website while looking for a rugby hat pattern. I love the green jumper also, do you have a pattern for it? It’s beautiful. Hi, Michelle. I’m not Gayle; my name is Nancy. 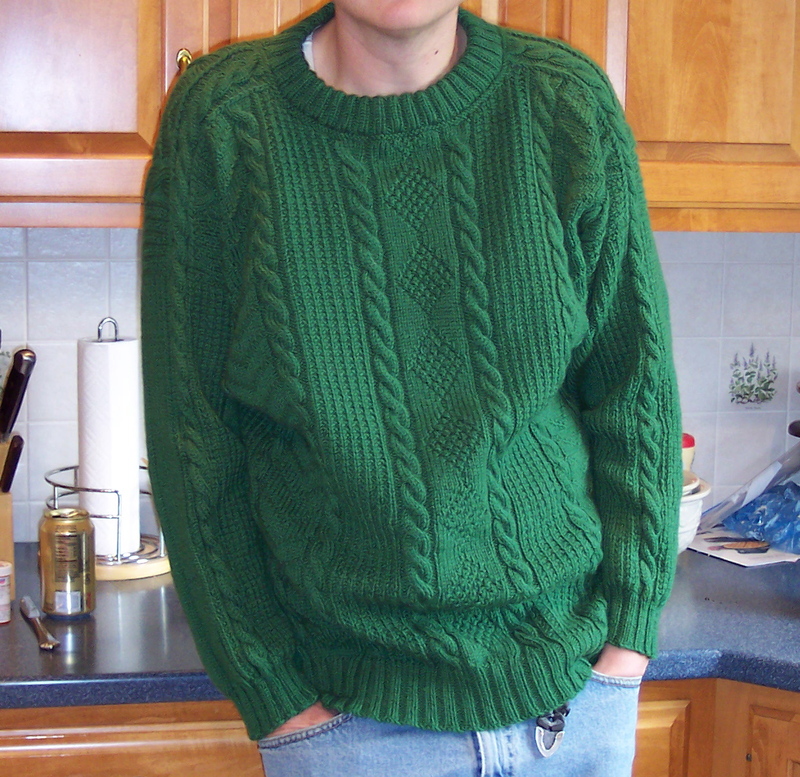 I’m not sure which green jumper you asked about, but since you describe it as beautiful (thank you) I’m guessing it’s the kelly green sweater that I made for my son. It is the Traditional Gansey from Sabine Dominick’s book Cables, Diamonds, Herringbone: Secrets of Knitting Traditional Fishermen’s Sweaters. Sorry Nancy I’ve just read back through the comments and realised you are in fact not Gayle. My apologies. Yes it’s the Kelly green sweater I’ve just fallen in love with it!! It’s so beautiful. Thank you for your reply.